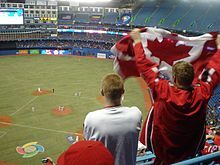 Pool C of the First Round of the 2009 World Baseball Classic was held at Rogers Centre, Toronto, Canada from March 7 to 11, 2009. Pool C was a modified double-elimination tournament. The winners for the first games matched up in the second game, while the losers faced each other in an elimination game. The winners of the elimination game then played the losers of the non-elimination game in another elimination game. The remaining two teams then played each other to determine seeding for the Pool 2. Times of March 7 are Eastern Standard Time (UTC−05:00) and times from March 8 to 11 are Eastern Daylight Time (UTC−04:00).